The Models MX53, MX54, MX55 and MX56 are hand-held professional digital multimeters that measure up to the toughest standards. They are built into a rugged housing which provides a separate battery and fuse compartment to isolate the electronics of the DMM from contamination. These meters offer a complete set of measurement ranges and are in compliance with international safety and quality standards to ensure a professional and reliable measuring tool. 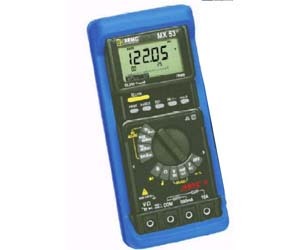 These True RMS (AC or AC + DC) meters provide accurate measurements of non-sinusoidal waveforms. The large and easy-to read LCD features a selectable 50,000-count digital display.